Atlanta, Ga. – July 19, 2016 – BasisCode Compliance, provider of the industry’s most comprehensive integrated compliance management software solutions for investment advisors, broker/dealers, compliance consultants and other professional services firms, has been named a finalist in the compliance category of WealthManagement.com’s 2016 Industry Awards for the version of its software developed for compliance consultants. 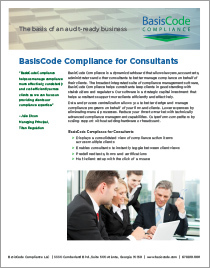 In October, BasisCode introduced the software to help compliance consultants, attorneys, fund administrators, auditors, accountants and other service providers more easily manage compliance on behalf of their clients. Enhanced to ease multi-client setup, the BasisCode Compliance™ software centralizes compliance task management, from testing and risk assessment to insider trading surveillance and certifications—all within a single platform. 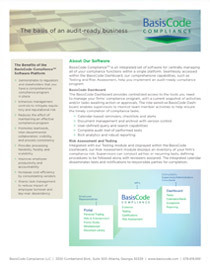 The BasisCode Dashboard displays a consolidated inventory of a firm’s risk exposure while offering seamless access to a comprehensive set of compliance management tools. The BasisCode Portal engages consultants, supervisors as well as non-supervisory staff in maintaining a culture of compliance. The WealthManagement.com’s Industry Awards is the first program to honor outstanding achievements by companies that support financial advisor success through innovation, enhanced service quality or an enriched advisor/client experience. From hundreds of nominations, this year’s finalists were chosen within more than 60 award categories, including compliance, disruptors, risk tolerance/profiling, TAMPs, and technology innovation. An expert panel of judges from leading industry organizations determined the award finalists. Winners will be announced at an awards ceremony in New York City in September. Award-recognized BasisCode Compliance offers the industry’s most comprehensive, award-recognized compliance management software that improves compliance management for investment advisors, asset managers, broker/dealers, compliance consultants fund administrators and other professional service providers. The intuitive BasisCode Compliance software spans functionality, from testing, risk assessments, personal trading, gift and entertainment (GEM), insider trading surveillance and staff certifications—all within a single unified platform. 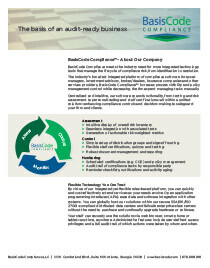 For more information about BasisCode Compliance and insider trading software, visit www.basiscode.com.